I've been out with the flu for a few days, but I am drinking gallons of tea and eating oranges like crazy all to get ready for my interview tomorrow with PBS/NPR's own Rick Steves. Tomorrow I'll be taping a segment for his radio show, Travel with Rick Steves, on public radio. 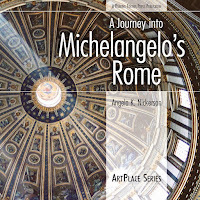 We will be talking about my book, A Journey into Michelangelo's Rome, and the imprint Michelangelo left on the city. Do you have a question for Rick or for me? Leave a comment on the radio show's web page, and you might just be able to be a caller on the show. For more details, check out the recording sessions link below. You can see all of his other great guests this week including Greg Mortenson, author of Three Cups of Tea and Richard Ellis who will be discussing the future of the polar bear and his book On Thin Ice. I hope to chat with you tomorrow! And I'll be sure to let you know when the show will be scheduled to air. Here's a question: If Michelangelo were alive today and you had the chance to give him a guided tour of modern Rome, where would you take him? YAY!! echoing caitlin, how very exciting for you! i'll be happy to listen!